I-It's true! The PlayStation 3 really has been supported for over 10 years! The gaming industry is at an unprecedented time of uncertainty. Perhaps E3 2017, coming up in a month, will make things more certain. ...Perhaps they will be even less certain. Even Microsoft is confused about what Project Scorpio will mean, and if games will be exclusive to it or not. That's not a good sign when the pioneer of the end of videogame hardware life-cycles isn't even putting on a brave face and bluffing their way out of it. Interestingly enough, Nintendo of all companies is traversing the traditional route in trying to maintain console generations. Sure, the 2DS/3DS having power-upgrades mid-cycle is complicating things, but that's all a sideshow compared to the ultimate promise of the Nintendo Switch — a hybridisation of Nintendo's console and handheld lines. 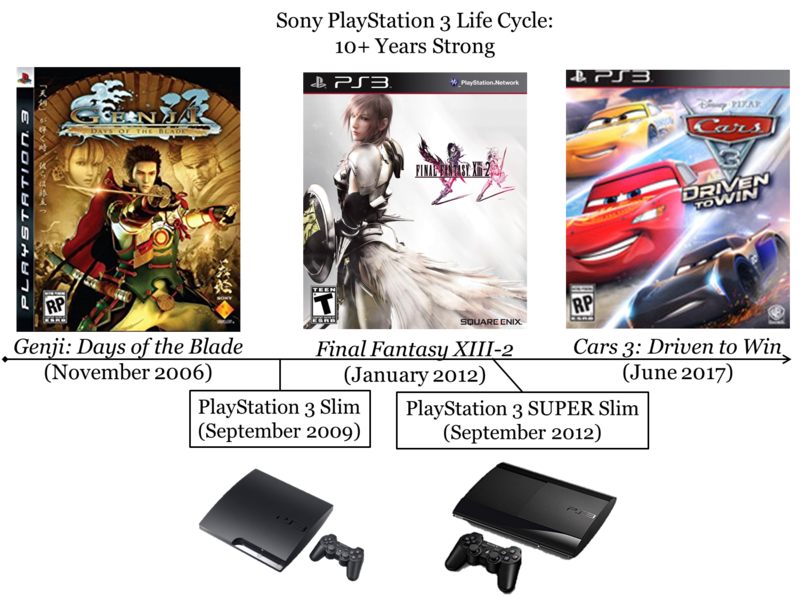 (Keep in mind that Nintendo is the only one WITH a handheld line, since the PlayStation Vita might as well not exist.) Being a hybrid system in no way overturns the hardware generation life-cycle mindset. What Microsoft and maybe-maybe not Sony are doing is revolutionising the mindset — they just don't know where that revolution will lead them. Why is this unprecedented uncertainty happened NOW? Well, if you look at all of the other components of the electronics industries, you'll see that this has been going on for a while now. Software has moved to an agile cloud-based subscription model on the idea that it's more profitable in the long-run. Hardware is pretty much “release something iteratively new as soon as you can” within a year or two after the previous hardware launch. Only videogames has had this clearly-defined pattern of hardware launches, telling software developers, “these are the tools you'll get to play with for half a decade”, even if what's cutting-edge has long moved on. Now? Everything is in flux. Oh, Moore's Law may or may not have something to do with it, but people can't even agree if Moore's Law is dead or not, so let's hold off on that. For now, console gaming is going to look a bit more like PC gaming where there are many more platform variations to develop and compatibility-test for. That takes away a unique aspect of this industry, and I only hope that developers will be able to stay on top of things, especially with game development cycles being as long as they are. Can't wait for E3? Neither can KoopaTV! KoopaTV hopes that for the sake of the industry (and the staff's collective curiosity), many of the questions raised in this article will be answered in a fun and entertaining way. Do you want the console market to look more like the PC gaming one? Can you even keep up with where this industry is headed? And do you count Cars 3: Driven to Win as on-going support for the PlayStation 3? What is YOUR favourite generation of gaming? Vote in the Best Year in Gaming GameFAQs contest! Project Scorpio is revealed to be the Xbox One X, with 4k resolution and backwards compatibility. The past few generations of consloes have become so streamlined with additional features that they seem more like media players than actual video game consoles. What I like about the Switch is that it is a traditional console that is focused primarily on games while also be an unique concept at the same time. So you don't want your gaming consoles to lose their gaming console-ness and become PCs/media players. Ludwig, I don't want the good video game consoles to go to PC, but the other ones like Microsoft's can go ahead and off themselves into a nice comfy oblivion for all I care. I think this mindset comes from people who can't design enjoyable games. They can make really pretty games, with impressive specs and amazing flop rates or what not- but those things are irrelevant to actually good games, and actually good game companies and their respective consoles. My opinion is Biased only through first hand experience. I've owned the big 3, and of those 3 only one has reinvented itself time and time again, with a huge stack of replayable games. You probably know which company I'm talking about. HD rumble- whoops, I might have given the company away- seems silly now, but I'm sure it will be cool as soon as the other consoles develop it and "invent" it for themselves too! Of course, I think it's better for there to be more consoles on the market, more companies too, because that breeds competition, and competition breeds lower prices and higher quality or at the very least a little variation in what's offered up as video games. Call of Duty is alright I guess, but it shouldn't be the model for every single game put out for the rest of our lives. That's why I think it would be worse for all of us if those two other companies just kind of blobbed out of existence and into the world of PC 'gaming'. We just might end up with less selection, even if the other selections were kind of icky and boring. One hour of that vanilla horizon what-not game really makes me appreciate Breath of the wild a whole lot more, just like that creepy guy in the overalls and unkempt mustache made me appreciate the finer points of hedgehogs. Maybe you should just write a guest-article for KoopaTV, since you obviously have lots to say. I will say this: You can end console life-cycles and make your consoles PC-esque and still be in the same competitive sub-industry that Nintendo is firmly in, so you still have competitive pressures.